INTRODUCTION:Acute appendicitis is one of the most common causes of abdominal pain that a general surgeon will encounter. The appendectomy has traditionally been preformed via an oblique right lower quadrant incision, transecting the three layers of muscle of the anterior abdominal wall to gain access to the peritoneal cavity. Surgeons across the globe were employing this approach for appendectomies but recently, favor has gained with the laparoscopic approach. The first laparoscopic appendectomy was described in 1983.As improvements in advanced laparoscopic skills developed, modifications to the traditional laparoscopic appendectomy emerged. Here, we describe our modification to the laparoscopic appendectomy: a single incision laparoscopic appendectomy completed entirely intracoporally. METHODS: From September 2008 to September 2009, 20 single incision laparoscopic appendectomies were preformed by two surgeons trained in advanced laparoscopy. In all cases, the diagnosis of acute appendicitis was confirmed preoperatively based on clinical presentation, laboratory values and radiologic studies. Of the 20 cases, there were 14 males and 6 females with a mean age of 35.9 years and mean weight of76.4 kg. No patients were excluded from the study. SINGLE INCISION LAPAROSCOPIC APPENDECTOMY TECHNIQUE: Using an open Hasson technique, the abdominal cavity is entered via the umbilicus with a 2.5 cm incision. A flexible SILS port with three working chambers is inserted through the umbilicus. This port has the capability to interchange 5 mm and 12 mm cannulas to aid in dissection and stapling the appendix. The camera and two dissectors are inserted through three 5 mm ports to dissect the appendix. When the appendix is free from surrounding tissue, a 5 mm cannula is replaced with a 12 mm cannula to staple across the base of the appendix and the mesoappendix. The appendix is then exteriorized via an endocatch bag. 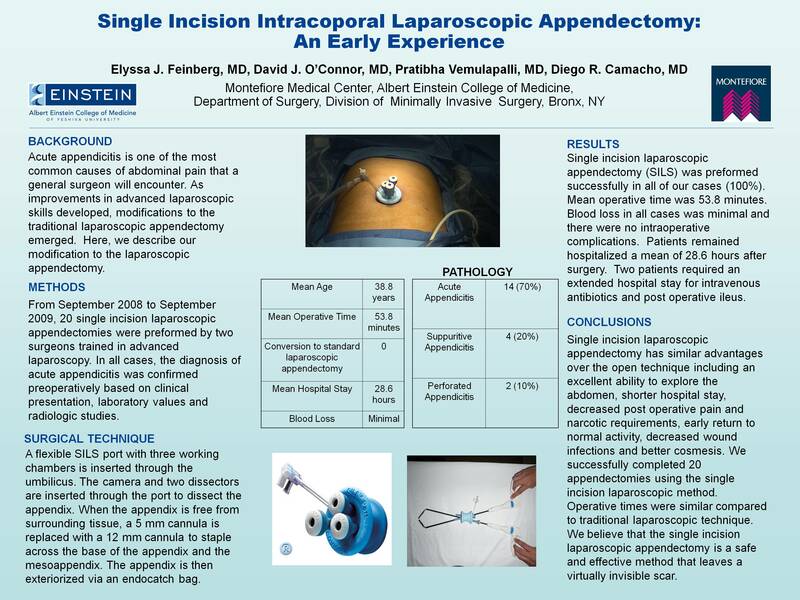 RESULTS: Single incision laparoscopic appendectomy was preformed successfully in all of our cases (100%). Mean operative time was51.5 minutes. Blood loss in all cases was minimal and there were no intraoperative complications. Patients remained hospitalized a mean of 28.6 hours after surgery with the exception of two patients with perforated appendicitis who required an extended hospital stay for intravenous antibiotics and post operative ileus. Pathology reports revealed that there were9 cases of acute appendicitis, 9 cases of suppurative appendicitis and2 cases of perforated appendicitis. In the post-operative period there has been one patient with a superficial wound infection treated with oral antibiotics. CONCLUSION: We successfully completed 20 appendectomies using the single incision laparoscopic method. Operative times were similar compared to traditional laparoscopic technique. We believe that the single incision laparoscopic appendectomy is a safe and effective method that leaves a virtually invisible scar.